What is the meaning of ‘hoof quality’? How complicated is hoof biochemistry? Very. I was just on Facebook, looking at a query about how to improve hoof quality in horses. ‘Feed herbs’ was the one response. ‘Biotin’ was the next response. I agree with both people, but there is more to it. How important is nutrition in producing good quality hooves? It is vital. The hoof wall is about 93% protein on a dry matter basis. Lewis in 1995 showed that a diet low in protein lead to reduced hoof growth and splitting and cracking of the hoof. The sulphur-containing amino acids are of particular importance. Ekfalck et al. (1990) found a distinct difference in the distribution of these tow. Cysteine was mostly found in the keratinocytes of the epidermal laminae, whereas methionine was found in the stratrum. Methioni ne is an essential amino acid (can’t be manufactured by the horse’s body), so must be provided in the diet. Methionine can be converted by the horse into many other amino acids, including cysteine. The entire range of amino acids is present in kelp supplements. You would think that a diet intended to produce rapid growth in horses would result in rapid hoof growth. But no, it doesn’t. The amino acids necessary for optimal hoof growth seem to be completely different to those needed for body growth. When humans have weak fingernails, gelatine supplementation helps. But not in horses. Goodspeed et al showed that gelatine had no effect whatsoever on hoof strength. Minerals are also important, especially zinc and copper. Horses with poor horn quality have lower blood and hoof zinc levels. Supplementation with zinc leads to increased hoof zinc levels. Horses low in zinc and copper are more likely to develop white line disease. Chelated zinc works far better than unchelated zinc. Calcium is also vital for hoof health. One of the easiest ways to supplement calcium is to add a slice of lucerne to your horse’s daily diet. The nutrient with the most dramatic effect on hooves is the vitamin, biotin. Supplementing at levels of 15 to 30 mg per day has positive effects on growth and quality in most horses. (In the horses where biotin doesn’t help, increased protein and calcium seem to do the trick.) 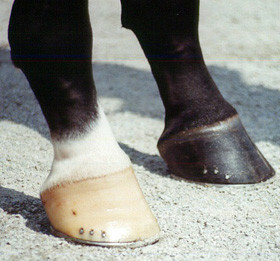 It does however require patience, as it takes 9 to 12 months to replace an entire hoof. Comben et al. (1984) was the first to show a definite correlation between biotin and the thickness and hardness of hoof, including the fact that shoes lasted longer due to stronger horn. Biotin also reduced hoof horn defect, increased tensile strength, increased rate of growth, decreased cracks and improved the condition of the white line. Even more dramatic results were achieved when doses up to 60 mg per day were used. 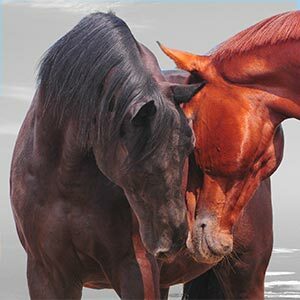 The bad news about biotin is that 70% of horses’ hooves deteriorate again after supplementation with biotin is stopped or decreased. Choline and Inositol are B vitamins that you won’t find in many hoof supplements. They are both involved in the metabolism of lipids and cell membranes in the body and help to ensure that the hoof stays elastic and waterproof. Lastly, Rosehip is a herb which provides a large amount of natural Vitamin C. Which in turn helps to maintain strong, healthy connective tissue as well as increase immunity and the horse’s ability to fight disease – hoof and otherwise. Lewis, L.D. 1995 In: Equine Clinical Nutrition. Williams and Wilkins, Philadelphia. Frap, David. 1998 Equine Nutrition and Feeding. Blackwell Science. Huntington, P. and Pollit, C. Nutrition and the Equine Foot, Kentucky Equine Research, Australasia. Ekfalck, A., L.E. Appelgren, B. Funkquist, B. Jones, and N. Obel. 1990. Distribution of labelled cysteine and methionine in the matrix of the stratum medium of the wall and in the laminar layer of the equine hoof. J. Vet Med. Series A 37:481-491. Graham, P.M., E.A. Ott, J.H. Brendemuhl, and S.H. TenBroeck. 1994. The effect of supplemental lysine and threonine on growth and development of yearling horses. J Anim. Sci. 72:380-6. Richardson, G.L., and E.A. Ott. 1977. Influence of protein source and lysine intake on growth and composition of hoofs of yearling foals. In: 69th Ann. Meeting Amer. Soc. Anim. Sci. p. 105 (Abstr.). Goodspeed, J., J.P. Baker, H.J. Casada, and J.N. Walker. 1970. Effects of gelatin on hoof development in horses. J. Anim. Sci. 31:201 (abstr). Ott, E.A., and E.L. Johnson. 2001. Effect of trace mineral proteinates on growth and skeletal development in yearling horses. J. Equine Vet. Sci. 21:287-292. Hihami, A. 1999. Occurrence of white line disease in performance horses fed low-zinc and low-copper diets. J. Equine Sci. 10:1-5. Coenen, M., and S. Spitzlei. 1997. The composition of equine hoof horn with regard to its quality (hardness) and nutrient supply of horses. Proc. 15th Equine Nutr. Physiol. Symp. p. 209-212. Butler, K.D., Jr., and H. F. Hintz. 1977. Effect of level of feed intake and gelatin supplmentation on growth and quality of hoofs of ponies. J. Anim. Sci. 44:257-261. Comben, N., R.J. Clark, and D.J.B. Sutherland. 1984. Clinical observations on the response of equine hoof defects to dietary supplementation with biotin. Vet. Rec. 115:642-645. Josseck, H., W. Zenker, and H. Geyer. 1995. Hoof horn abnormalities in Lipizzaner horses and the effect of dietary biotin on macroscopic aspects of hoof horn quality. Equine Vet. J. 27:175-182. Geyer, H., and J. Schulze. 1994. The long-term influence of biotin supplementation on hoof horn quality in horses. Schweiz. Arch. Tierheilkd. 136:137-49. Reilly, J.D., D.F. Cottrell, R.J. Martin, and D.J. Cuddeford. 1998. Effect of supplementary dietary biotin on hoof growth and hoof growth rate in ponies: A controlled trial. 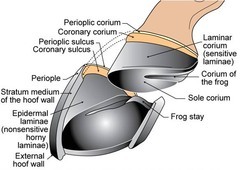 The Equine Hoof. Equine Vet. J. Suppl. 26:51-57. Hutjens, M.F. Feed Additives: Which, When, and Why. Department of Animal Sciences, University of Illinois.